Ani Gjika is an Albanian-born poet, literary translator and writer. Her book Bread on Running Waters (2013) was a finalist for the 2011 Anthony Hecht Poetry Prize, and the 2011 May Sarton New Hampshire Book Prize. Gjika moved to the US when she was 18, earning an MA in English at Simmons College, and an MFA in poetry at Boston University. Her honours include awards and fellowships from the National Endowment for the Arts, the Robert Pinsky Global Fellowship, English PEN Translates, Framingham State University’s Miriam Levine Award, and the Robert Fitzgerald Translation Prize. Luljeta Lleshanaku was born in Elbasan, Albania. 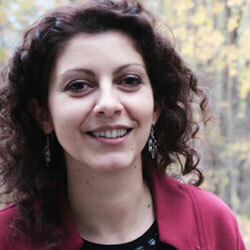 She is the author of seven books of poetry in Albanian. Book length translations of her work into other languages include Antipastoral (Italy, 2006), Kinder der natur (Austria, 2010), Dzieci natury (Poland, 2011), and Lunes en Siete Dias (Spain, 2017). She has won several prestigious awards for her poetry, including PEN Albania 2016, and the International Kristal Vilenica Prize in 2009. 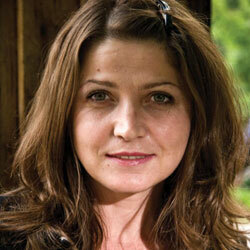 In 2012 she was one of two finalists in Poland for their European Poet of Freedom Prize. Strangers are building a new house next door. Hammers and a bustle of arms. Their large window opens to the east. drags a bucket of water half his size. The world holds its breath for one moment. leave the symbol for infinity in the dirt. nobody bothers to look at. They started with the barn. on the first floor of the house. and switched the lights off early. like mounds of snow along the road. or your first eclipse of the sun. 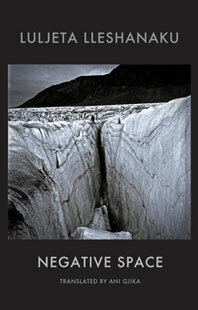 Have you read Negative Space by Ani Gjika, translated from the Albanian by Luljeta Lleshanaku? Add your comments to this page and let us know what you think.